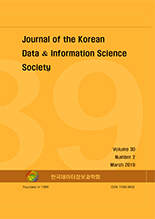 Woo Dong Lee, Dal Ho Kim, Sang Gil Kang,(2019).Bayesian inference for nonlinear functions of means in normal distributions.한국데이터정보과학회지,30(2),491-502. We consider the objective Bayesian inference for the product of different powers of two means in the normal distributions. In order to perform the objective Bayesian inference, the noninformative priors are essential. In this paper, we develop the matching prior as the noninformative priors for the product of different powers of two means in the normal distributions. We develop the first order matching priors using the orthogonal parameterization. Then we reveal that Jeffreys’ prior and the matching prior have the different forms. Also we prove the propriety of posteriors under general priors based on the developed priors. We investigate that the matching prior provides better performance than Jeffreys’ prior in view points of coverage probability from numerical studies.